Our Doylestown office serves residents of Lower, Central and Upper Bucks County. 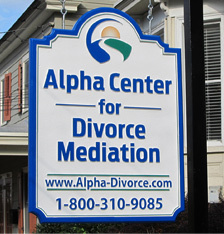 Located in a charming, historic building, Alpha Center for Divorce Mediation’s office on Main Street in Doylestown is within walking distance to the shops, restaurants and attractions in the heart of the borough. Our office has a tranquil setting with an outdoor garden area for quiet place to relax and reflect. All appointments with our mediators are privately held in our comfortable, well-appointed consulting rooms. This office is handicapped accessible. This location is a convenient commute for Central and Upper Bucks County residents via Routes 202, 313, 413 and 611. Metered parking (free after 5 pm.) is available across the street. The Bucks County Parking Garage, which offers 24 hour free parking, is one block away.